It has been a while since I have posted the last article – so many things happened in the meantime, that I am hardly able to keep pace with all these interesting developments and events in and around the media (especially as regard Wikileaks but I will focus this in another post; however, there is a very interesting article in the current issue of the New Statesman I can recommend). There was just to much to do, for instance preparing my conference paper for this year’s Media, Communication, and Cultural Studies Association Conference (MeCCSA) at Salford, Greater Manchester. I just returned from this very interesting, informatory trip to Northern England and will provide here a summarization of my experiences and impressions. Let me begin with some information on MeCCSA: It is an international organisation for academics in media-, communication-, and cultural studies with a keen interest in stimulating intellectual exchange across all relevant disciplines. However, “international” only to a certain extent as it is mainly based in the UK. Its main aim is to promote the diversification of influences on as well the professionalization of research in the relevant field of subjects. Since 2000 it holds an annual conference, each year at another of Britain’s universities. Former places of event included for instance the London School of Economics, University of Cardiff, University of Leeds etc. etc. 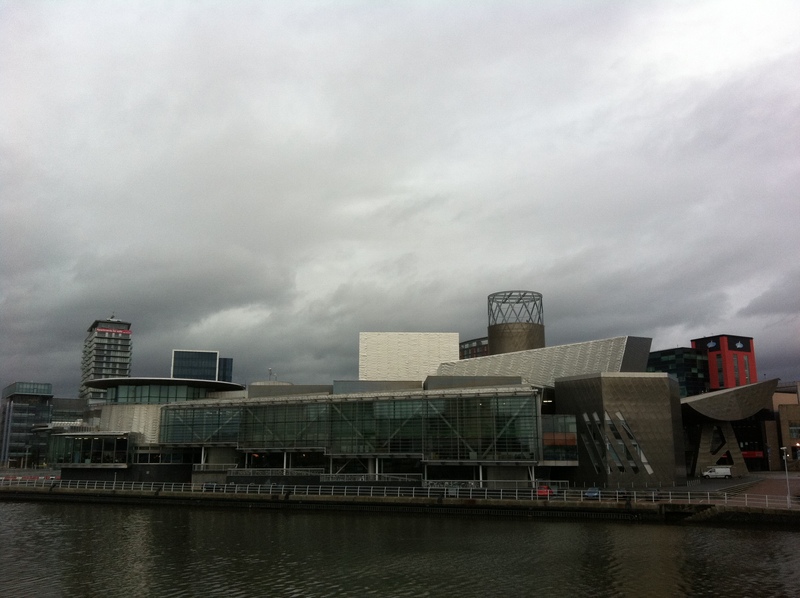 MeCSSA 2011 was hosted by Salford University’s department for Communication, Culture, and Media, which organized a warm welcoming to and professional course of the conference in the very appealing Lowry, a huge, postmodern theatre builiding at the Salford quays – right beside the BBC studios and MediaCity UK. This year, around 140 researchers presented their current or recently finished projects on topics ranging from digital culture, media and democracy, visual- and film arts, gaming, media education, media discourses, journalism – you name it. Many of the contributors have a long professional career in academics, and I knew quite a few names from publications I had read during my studies (e.g. Stuart Price). I listened to delegates from New York, Toronto, London, Copenhagen so on and so forth. Interestingly, I was the only contributor from Germany…I think here is a clear lack of communication between the German and the international academic discourse on the respective issues detectable. In fact, I think I was the only one without a Ph.D and who had not published any article or a monograph (yet), too. Hence it was a great opportunity to get in touch with some bigger and smaller “grandeurs” of this specific academic branch. Besides, I gathered some impressions from other research projects and their perspectives on relevant issues. I thereby primary attended panels which dealt with topics of my personal academic interest, such as political communication, democracy and media etc. Especially the delegates from Cardiff University, Goldsmiths, London Metropolitan, and East Anglia provided some really interesting papers. During my panel, I was allowed to present the results of my MA research project on political communication online during last year’s general election. 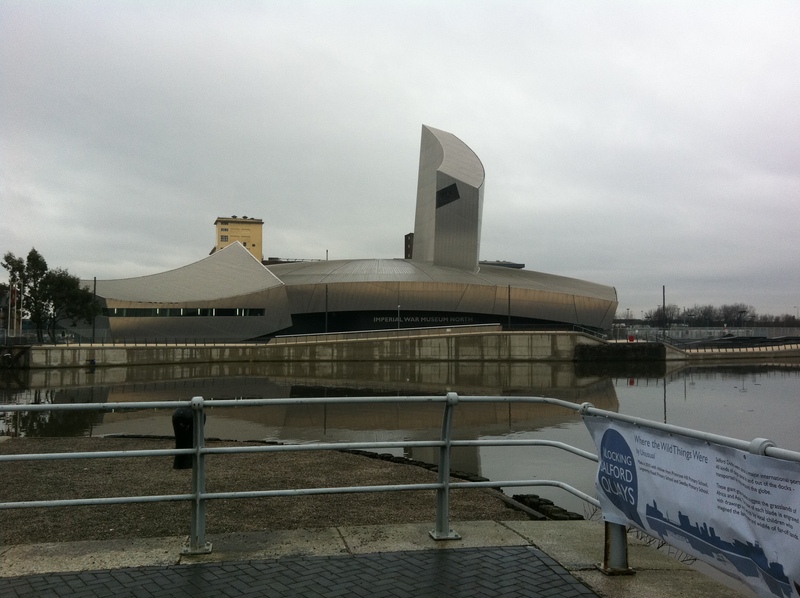 My audience was rather small but consisted of genuine experts in this area of research – luckily, they liked what I showed them and I was able to establish important contacts with possible supervisors for my Ph.D. After my presentation and the subsequent discussion, which provided further stimuli for future research, I took the chance to visit the Imperial War Museum North – after all I’m a student of history, with particular interest in the events of the 20th century of which war is an inherent part. Here I got a glimpse on the commodification of British and world military history. But that will be the topic of another post. 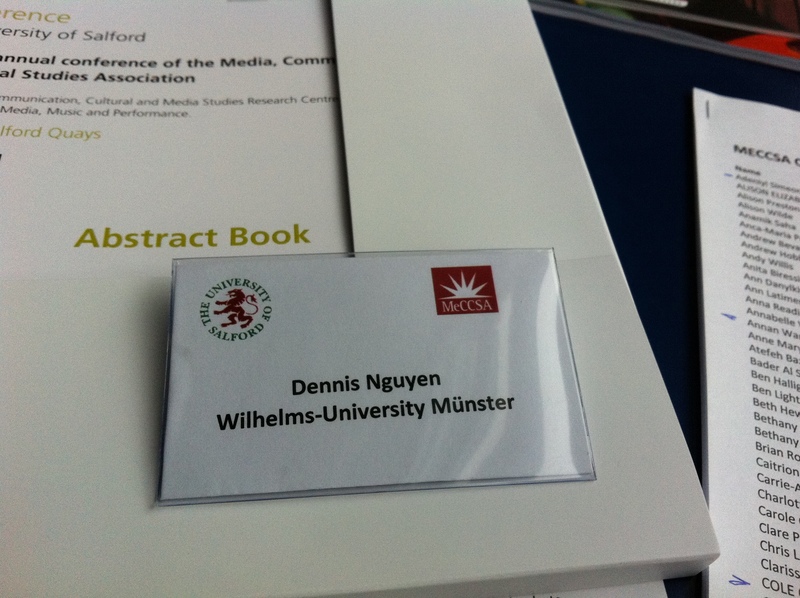 Altogether, it was a very interesting and pleasant experience – I will definitely apply for next year’s conference again. I can only recommend to those of you, who see their future in academics, to do so as well! It is a great chance for professional exchange and to make some interesting connections. It is also a very satisfying experience to receive positive feedback and recognition for your own research. Next MeCCSA will be held at the University of Bedfordshire.